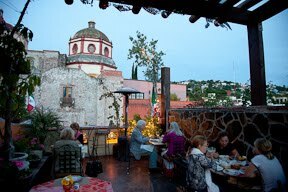 Our third visit to San Miguel de Allende was also our third visit to La Posadita, a terrific restaurant on a terrace with views of San Miguel. The food is a little upscale, but is fitting for the first night south of the border. Red and green salsas arrive with house-made chips soon after we are seated. Peruse the lengthy menu, but end up on the page with traditional foods. Start with a chunky, mashed guacamole, simply made with buttery haas avocados, fresh tomatoes and a touch of chile. 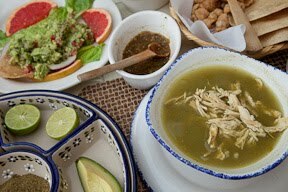 Follow that with a Guerrero-style posole, a rich broth with shredded chicken and hominy. It’s enhanced by the attractive condiment plate with limes, oregano, onion, avocado, ground red chile, coriander and chopped jalapeño. Still more options are available to customize your posole with tostadas or chicharrones. 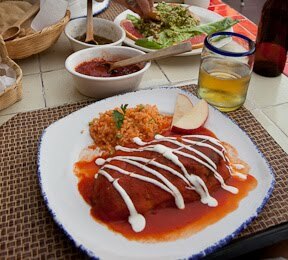 The Chile Relleno is a large poblano filled with Oaxacan cheese (more than is necessary), lightly battered and smothered with a wonderful red tomato broth. Very nicely done and just what I wanted. The service is prompt and courteous and the atmosphere is relaxing. Food this good, in a setting this refined, in a town as pricey as San Miguel, should cause most anyone to choke on the bill. Not here. All of this with a beer and limonada came to 285 pesos (@12.5 that is $22.80). 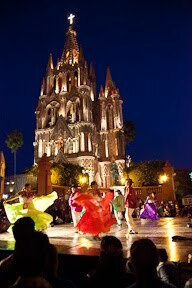 La Posadita is reason enough to visit San Miguel de Allende. Although lots of people reportedly come for the architecture, art, the realty offices with their many million dollar homes for sale. Jennifer, First I want to congratulate you and Michael on your marriage. Even though I haven't seen you for years at the ranch, I am so glad your mother turned me on to your website and I am so enjoying your stories and pictures. It takes me back to our trip to Cozumel and the food. Your pictures are driving me to hunger at 2 am this morning. We had stayed at a hotel on the Leeward side and asked the front desk for a place to have some lobster. They sent us on a journey we still talk about. Down little streets and alleys and further into the bowels of the town. We finally found our destination and to this day, I have never had any lobster than even compares to what we had that night. It was so large we couldn't finish, coming out on a very large platter and sitting long ways on the dish. This was after a wonderful chicken soup, and chips and guacamole, and garlic bread enough to fed 12. I hope you and Michael find this little gem and enjoy as we did. I love your pictures and wish you well on your new journey through life.